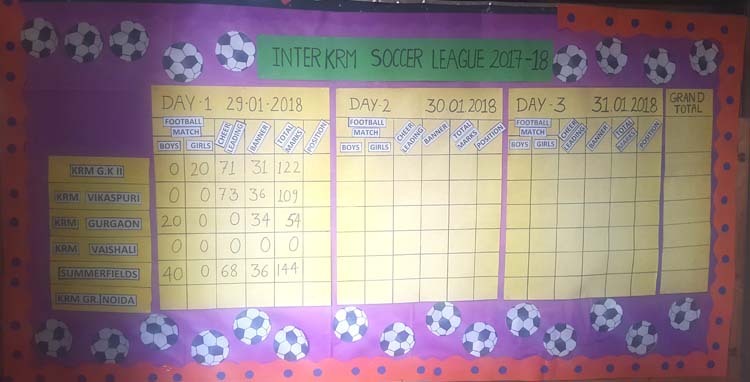 K.R Mangalam World School, Vikaspuri organized the Inter K.R.M Soccer League on 29th January 2018. The Principal, Ms.Meenu Kanwar took the salute and hoisted the school flag. The oath was taken by all the sportspersons. This was followed by the school song which was sung by the young Mangalites. It was then followed by the school students marching to the tune of the school band. The Soccer League was then declared open by the school Principal. A plethora of matches took place in which the contestants involved themselves in the true spirit of sportsmanship. For the first time the competition saw the girls’ team also participating enthusiastically. On the first day of the event , Summer Fields School bagged the first position followed by KRM GK II.